Say that 10 times fast. It's that time of year "when the world falls in love, every song you hear seems to say…" eat this. taste that. just one bite…it's holiday party tiiiiime. And with the holidays, comes a great deal of anxiety and pressure to meet social dining norms. Just the other day I was speaking with a client who said, "I'm really starting to freak out about the [Thanksgiving] meal. I don't know what I'll eat!" Let me first say, RELAX. Stress is the #1 contributor to morbidity and we're in the business of keeping people healthy, so find your yoga mat and zen out for awhile. Don't stress!! I promise you, that if you have a plan and put it to practice you can succeed in any dining and/or social situation. Will that plan need to be modified or adapted? Perhaps. Does that mean you're completely derailed for the day? Week? Season? Absolutely not. The holidays are a time to enjoy one another. Food and drink are the accessories to your functions. Remember that. 1. Pregame. Noooo, I'm not talking about what you did in college or before the ball game. I want you to enjoy a small snack before you get ready for your big bash. You want to arrive to your party satisfied, not starved. If you show up hungry, having 'saved' your calories from earlier in the day, you'll dive head first into the spinach dip and won't surface until you've polished off the cookie tray. 2 hours before your event snack on a string cheese and turkey breast. Have a handful of nuts and an apple. Make yourself a Greek yogurt parfait with a few berries and almonds. On a scale of 1 to starving, you're showing up to your party at a satisfied 4 or 5. 2. Wait your turn. Have you ever read that Bible verse, Matthew 20:16, "the last shall be first and the first shall be last…" I want you to be last in line at the buffet table because after everyone else has helped themselves those dishes will look a lot less appetising. Don't underestimate the power of beautiful food. That apple crisp looks a lot better before 15 people have smashed it and smooshed it around on the plate. 3. SIP the booze. Did I just give you permission to drink!? Obviously, the best case scenario is one where you're hydrating with sparkling water and decaf coffee, but I'm not that naive. Holiday drinks add up quickly. Just one cup of eggnog has 305 calories BEFORE you add the alcohol. A 4oz martini has over 150 calories…a few of those add up quickly. Choose to sip spritzers. Mix 2 oz of alcohol with 2 oz of club soda or cranberry juice to make those calories last a little longer. Or you could just limit yourself to one drink, but after one your self control gets a little tipsy. 4. Wear buttons. Those black stretchy pants you like to wear? Toss 'em. That dress with the belted waist that hides your middle? Keep it in the closet. Wear something that buttons or zips or fits your form. Why? Because you should be able to feel when you've had too much. Nobody wants to walk around at a holiday party with a food baby hanging over your trousers. This, my friends, is called preventative care! 5. Play tetris. Not on your phone. Put those away - you're at a party! When you go to fill up your plate, don't allow any of your food items to touch or be stacked on your plate. This will keep you from piling…and piling…and piling. Also, one plate maximum. Be a good little party-goer and share with the other guests. 6. Be that guest. The one that politely declines leftovers 10 times before you discretely 'forget' the plate of extra cookies on the counter before making your departure. You don't want it in your house. 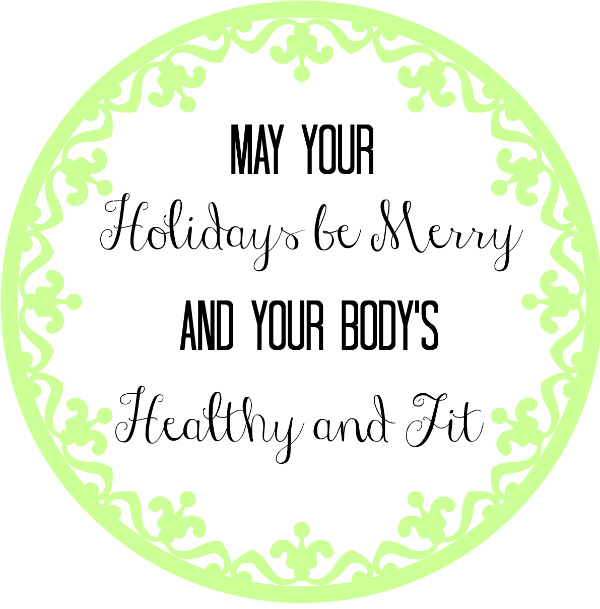 Simply say that you're trying to stay lean and green this holiday season and it would be better if someone else would enjoy it. 7. Go minty fresh. After you've enjoyed your allotted appetiser, drink or dessert, pop a piece of peppermint gum or a breath mint. It'll make your conversations more enjoyable for everyone around you and it'll keep you from going back for more. Peppermint has also been shown to be a useful appetite suppressant! Win-win!! 8. Be mindful. Don't lose track of what you're eating because the company is so engrossing. If that's the case, forget the food and focus on your friends, but every bite you eat should be enjoyed and calculated. Unfortunately, calories count, even on the weekends and at holiday parties. Try to keep a colorful plate centered around vegetables, fruits and proteins. Enjoy your food. Eat slowly and actually taste it. So what do you think? Are you ready? Equipped with adequate armor to resist those tantalising temptations? Remember, you have to be committed to your dietary goals and accept how much or how little you're willing to bend. Because, it's the job of family members everywhere to make you feel guilty for not eating that cookie, or not trying the casserole. If all else fails, blame it on me. My moms favorite line is, "oh, Nicole would kill me if I ate that. She has me on a strict eating plan." Do I? No, not really. But she knows what she wants to eat and when she wants to 'cheat'. Eat something because you want to and because you planned to, not because you've been guilted into it. Be an advocate of your health.